All the random chemicals we allow to touch, breath, or enter our bodies working in concert to magnify a problem. Alone they are safe, together a danger. It is my belief, scientist search for the silver bullet, the one chemical that caused the problem, then ban it. In reality, it is the sum accumulation of all these chemicals above working together, in unison to cause the problem. Yes, eating organic is fine, however the chemicals we use to take a shower, then after a shower is extreme. When you see any chemical, or concentration of a plant, try to say no. 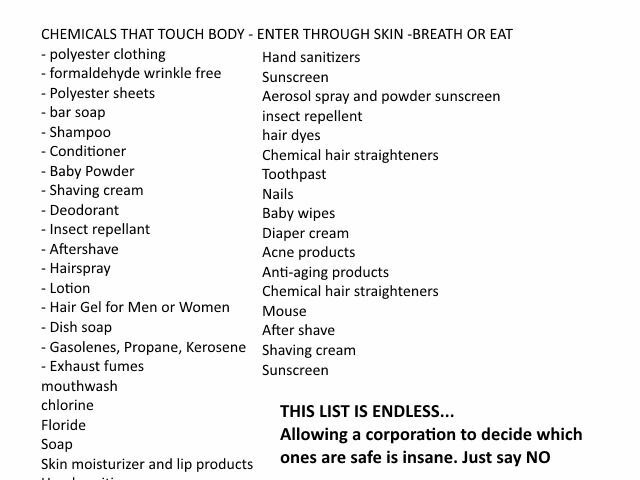 These chemicals annoy the cells, and cause cancer.